When Screaming Eagles president James Lambert talks about his passion for D.C. United, it goes beyond the pitch. The D.C. United supporter group Screaming Eagles has been around since 1995, even before the first United season, and has been giving back since the beginning. 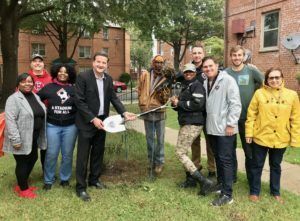 The group’s 1100+ membership can not only fill Buzzard Point’s new Audi Field with chants and drums for all the neighborhood to hear, but also fill the ground with newly planted trees. It is part of the group’s community outreach to show the Screaming Eagles care as much about the community around the stadium as the team inside it. Earlier this year D.C. United, DC SCORES and the Screaming Eagles announced a strategic partnership to ensure the three groups would work together to give back to the community. “We’ve always had a large focus on civic engagement and community service. We have a partnership with DC SCORES, who is also the charitable partner of the team, to support all their activities,” says Lambert. DC SCORES’ mission is to create neighborhood teams that give kids in need the confidence and skills to succeed on the playing field, in the classroom and in life. The Screaming Eagles partnership has included buying out a small section of seats in Audi Field to give to DC SCORES to bring their students, coaches and parents out to the matches. 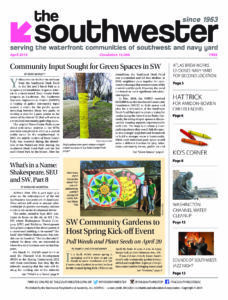 The tree plantings are just one part of a larger community plan. These organizations plan to continue to work to ensure that community benefits programs linked to the Buzzard Point redevelopment are not quickly forgotten.